Welcome at the holiday home "de la Grand Croix" in Crissay sur Manse ! The holiday home "de la Grand Croix" is ideally sized for 11 - 12 persons. It's a very charmy old house from the 16th century. 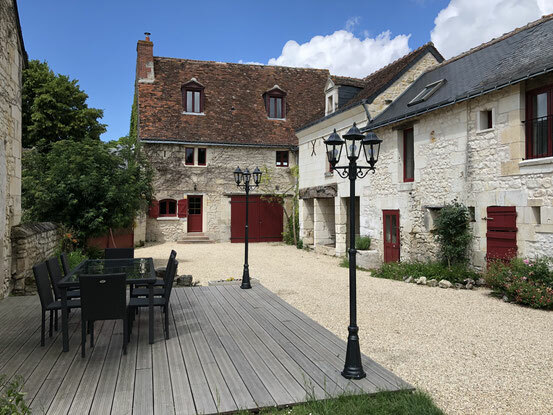 With its 5 bed rooms, the 3 bath rooms, the big living room (61m2), the fully equiped kitchen and the library, it offers all the necessary confort you need to spend an unforgettable stay in the Touraine ! A big garden of 4025m2 (not fenced) with trees and the bank of the Manse watercourse allows restful time in the shades as well as sunbaths. The house is equiped with a terrace of 25m2, a barbeque and table tennis for fun and/or restful hours. The Touraine is wellknown for its castles and its wines. Welcom to Crissay sur Manse, classified within the most beautiful French villages ! The owners Sabine & Uwe are delighted to receive you in their holiday home in Crissay sur Manse ! Don't hesitate asking for further information. We will answer in English. See you soon !